In the menu I saw some beautiful-looking unvegan dishes, and since they were small plates, I felt comfortable about ordering a few things. The first thing that stood out to me was their Poached Egg, Bacon, Mac and Cheese ($5.95), which just looked like a cacophony of awesome food. 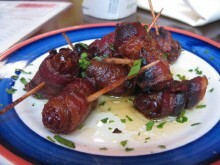 On top of that (not literally), I ordered their Bacon-Wrapped Dates ($5.95) and a Goat Cheese Croquette ($1.50). The first to arrive was the mac and cheese, which was actually much bigger than I had expected. For $5.95, this would have filled me up alone. Once I mixed all the prettiness together, I dug in and found that it was as good as it looked. The runniness from the egg added some nice flavoring to the cheese and the bacon was cooked to a delicious crisp. 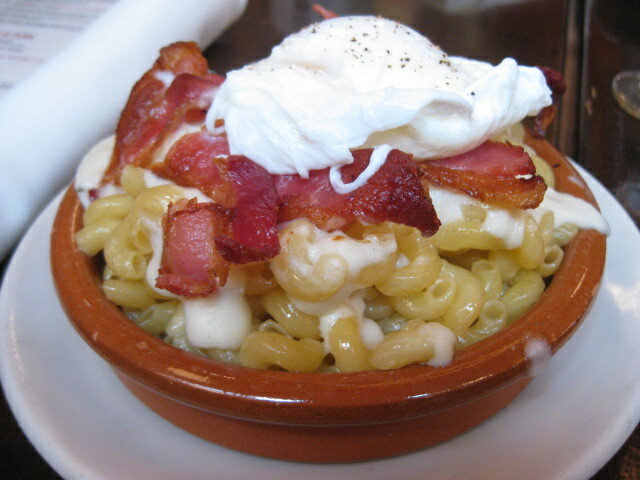 I didn’t think that a bacon mac and cheese could really be improved, but a the poached egg added a great touch to it. I’d like to date you. Then wrap you in bacon. After a bit of a wait, my bacon-wrapped dates arrived, looking just as delicious as my previous dish. This was definitely a dish for sharing, for a couple reasons. The first was because there were so many dates. The second was because somehow they managed to bring forth a vastly sweet richness from with the dates. Although the bacon was perfectly salty and crispy, it was not enough to tone down the sweetness of these dates. A lot of places stuff their dates with some sort of cheese before wrapping them in bacon, and now I know why. The cheese is there to provide some balance, and without that, this particular tapa was a bit too intense for me. Finished off with a ball of gooeyness. Lastly came my croquette. 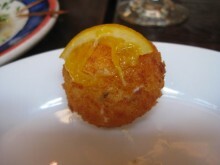 It was one simple, golf ball-sized ball of cheese and looked tasty. And tasty it was. Crispy, gooey, cheesy and more cheesy, this was the perfect pintxo to close out my brunch. In just a few bites, it was gone and I was one stuffed and happy unvegan. I was pretty impressed by Cafe Ba Ba Reeba. They had quite a selection of unique tapas, all for a modest price (oh how I miss Midwestern prices). My only regret is that I didn’t have the stomach capacity to try even more, but I’m sure they would have been prepared deliciously. Hey, if the only problem with your meal is that your dates are too rich, you’ve done a pretty damn good job.